In August 1947 the players of the Sing Tao Sports Club of Hong Kong arrived in London for a groundbreaking tour of southern England. League and cup double winners in their own land, the team had embarked on a very successful world tour at the start of the summer. Success was swift for the oriental club. It was still in its infancy, having only been founded in 1939 by Mr A.W. Hoe, then Hong Kong’s leading newspaper magnate. The first ports of call were Manilla in the Philippines, Singapore in Malaya and Rangoon in Burmah. Of the 24 matches already played they had won 21. The amateur side were the first Chinese club to visit Britain, and their first match was to be against Dulwich Hamlet. There was much media interest leading up to the opening game, indeed a film crew turned up at Champion Hill to make a newsreel. The Chinese ambassador was also present with the team at Dulwich. Photographer William Vanderson spent the day with the tourists taking a number of pictures. 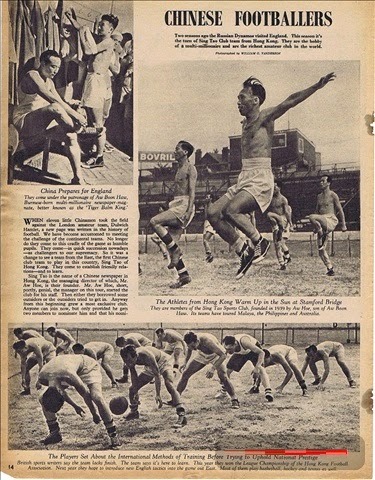 The shots included: the players enjoying a game of handball at the Stamford Bridge training session on the morning of the opening match with Dulwich; the Sing Tao manager sitting by the goalpost watching his team train; the players in the bath at Chelsea; the party on their way to Dulwich; Chinese naval cadets at Champion Hill; and action shots of the match. 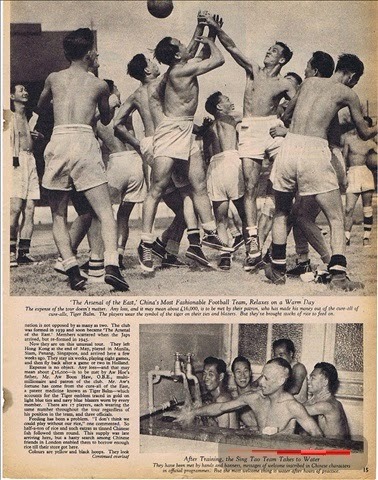 According to my records Great Britain actually beat China in the Berlin Olympics of 1936, and not the other way round. But there had been a world war since then so we won’t quibble with the Hamlet press secretary. The squad of eighteen players was captained by the 41 year-old, Fung King. The veteran of the side had commenced his career twenty years earlier, and had even represented his country in Germany, in the Chinese Olympic team of 1936. He had witnessed major changes in the game including the total restructuring of the Hong Kong Football Association after the Second World War. rattles, cheering their team on at Champion Hill. Following the Hamlet match, Sing Tao completed fixtures against two representative sides: the Athenian League and the Isthmian League. Representing the Isthmian League in their match against the tourists was Dulwich Hamlet’s Pat Connett, a late replacement [for George Bunce] in the Isthmian side. He scored the third ‘home’ goal in a 3-2 victory. Nine matches in all were played on the month long tour against the south’s top amateur sides, including Walton & Hersham (champions of the Corinthian League), Walthamstow Avenue, Oxford City, Ilford, Bromley and Barnet. I would hazard a guess that Sing Tao - sporting their yellow and black hooped jerseys, black shorts and yellow and black hooped stockings - were nicknamed either the Hornets or the Wasps. 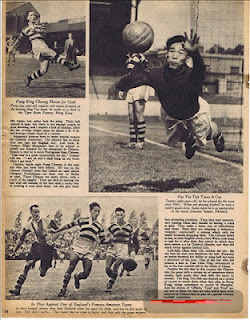 The following report in the South London Press headed “CHINESE HAD EVERYTHING BUT ABILITY TO SHOOT WELL” appeared a few days after the Hamlet match. “Though the Chinese footballers who met Dulwich on Saturday were beaten 5-2 the score was very far from being a true indication of the strength of the two teams. On most occasions the Hong Kong boys did things with the ball that had Hamlet all at sea. Time and again their uncanny anticipation and short passing split the home team’s defence wide open, but not one Chinamen had much in the way of shooting power. The scoring was opened within two minutes of the start when Tommy Jover, ran the ball past the adbvancing Chinese keeper. Within 20 minutes Beglan and Davies had added two more for the Hamlet. In that first half the visitors had eight good chances of scoring, but only Che Win Keung could score. The other forwards passed and fiddled until the opportunity had gone. The second half went pretty much the same way, with the Chinese boys well on top in midfield, but very poor (they even missed a penalty) in front of goal. Second half goals were scored for Hamlet by Connett and Jones, while Tsao Chiu Ting reduced the deficit. Charlie Tyson - A Job Well Done. Whilst on the continent Tyson was able to polish up his French, which was the subject he went on to teach so well at school. It comes as no surprise to also learn that he was in charge of football at Alleyn's for many years. He joined Alleyn's School in 1911, and was one of two Housemasters that served in the war. In 1921, and in honour of the school's two war heroes, two more Houses were added (to the existing six) to the School's House system. Thus Tyson House came into being. A real gentleman and a true patriot, Tyson always wanted the best for those under his care and he was ready to serve his country in the best way possible. He established a Cadet Corp. at the beginning of the First World War, before he went to France. He also helped the war effort during the period of the Second World War when he set up the South London Emergency Secondary School (SLESS) based within Alleyn's building. He eventually became the Head, a post he held until the end of the war. Looking back on his time at SLESS he wrote of it as "A job well done." He retired from teaching in 1947. Charles Francis Tyson died a few months before his 80th birthday at Harestone Nursing Home, Caterham, Surrey on the 31st October 1964. (Three days after Champion Hill's first floodlit match against Chelsea.) His address at the time of death was 16 Palace Road, SW2, less than two miles from Champion Hill. He left £7,419 in his will. His death occurred in the same football season as the passing of Bill Smart one of his old team-mates, Jack Hugo, Gil Goodliffe and Leslie Bowker - all former Hamlet stalwarts - yet sadly, his demise seems to have gone unnoticed by the club. (I may be wrong, only there is no mention in the 75 Year Book, whereas the other four gentlemen are. This suggests that links between C.F. Tyson and the Hamlet were severed many years earlier.) Well, if it's not too late for a quick obituary to Mr Tyson regarding his association with Dulwich Hamlet F.C. then I'd like to use his own words, and say, "It was a job well done." In piecing together this short article I am indebted to Mr Arthur Chandler, honourary archivist of Alleyn's School, Mr John Blackmore, historian of amateur international footballers and Mr Duncan Holley, official historian to Southampton F.C.